Genstar lands for sale: End of the era of sprawl? 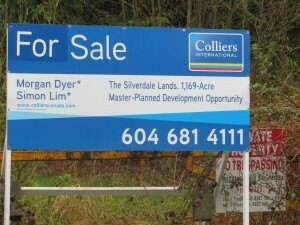 On the morning of March 19/15, large signs advertising the sale of Genstar and Madison’s 1,196 acre “Silverdale Lands” were posted on Clay road, Silverdale avenue, Gunn avenue, and Nelson street, in Mission. It was then announced that Genstar’s Silvermere Island and lake properties had already been sold, and Genstar had made a corporate decision to pull out of the development scene in B.C. altogether. The sale of these lands signals the end of decades of highly controversial planned urban sprawl, as the entire 3,400 acre Silverdale hillside was ultimately slotted for residential housing development, with Genstar and Madison taking the lead. The development agreement required them to bring services to the area, including water, estimated at over $70 million. Without these services, urban density development would not be possible. And now that the proponents have left the scene, what will the future be for Silvermere and the Silverdale Lands? To answer this question we need to understand the values of these lands to the people of Mission and to the larger community. Nestled between the highly productive Stave River, the Silvercreek wetlands, and the Fraser River, the Silverdale Lands include some of the most endangered fish and wildlife habitat in the Fraser Valley. Both the Stave River and Silvercreek support large populations of wild Pacific salmon, including over a half million Chum salmon, which spawn in the Lower Stave, and other species of salmonoids including Steelhead, Char and endangered Coho. This place, a tourism hotspot, draws scores of anglers to the Lower Stave every year. Silvermere Lake and Silvermere Island, located in the midst of the Lower Stave, are home to 113 animal species, including endangered Western Painted turtles and several other listed species (Red-legged frog, Barn owl, Bald eagle, Double Crested cormorant and Great Blue heron). Just to the east of the Stave, the forests of Silverdale are also home to numerous endangered and listed species, including but not limited to: Red-legged and Tailed frogs, Western Screech owls, critically endangered Oregon Forest snails, and Band Tailed pigeons. Thriving populations of local wildlife, including several species of owls (e.g., Saw-Whet owls, Northern Pigmy owl), ravens, amphibians, black bear, bobcats and numerous songbirds, are just some of the treasures supported by this green jewel in Mission. Not surprising, given this incredible biodiversity and abundance, the Silverdale Lands and surrounding area have a rich human heritage, with evidence of First Nation settlement dating back over 10,000 years, making this area one of the oldest known human settlements in Canada. More recent settlement is comprised of mostly rural properties, whose residents rely on the steady, clean water of the Silverdale hillside for their wells. This water, derived from both surface and deeper aquifer sources, and filtered by the local environment, would be at risk from development disturbance. The decision made in the 1970s, to plan and build a massive residential development in Silverdale and another residential development on Silvermere Island, completely failed to adequately take into account these tremendous environmental, cultural and historical values. As a result, numerous concerns over the years have been raised by local residents about contamination and degradation of their wells. More recently, both federal fisheries scientists and provincial environmental ministry scientists cautioned Mission that “moving forward without designating conservation areas and evaluating potential impacts would likely lead to an ecologically unsustainable development” (DFO Oct.17/08 & MOE Oct.21/08). The plan also failed to realistically account for the massive financial investment that would be necessary to provide services to the development, or for the drain on existing water sources, and subsequent costs of over $300 million for a new water source, to satiate the thirst of twice our current population. Can we imagine a future for Silvermere and the Silverdale Lands that respects the land and all of its human and nonhuman inhabitants? A vision that does justice to its priceless environmental, cultural, and spiritual heritage? A vision which doesn’t bleed our community coffers dry, and assists with our water conservation and carbon reduction efforts? It is time to begin serious discussions about the potential for a world-class park, establishing conservation areas for endangered species, for ecotourism facilities, a wildlife refuge at Silvermere, and even an outdoor research lab on local species at risk for a new university campus. As we free our minds from assuming past decisions must proceed, and sprawl on the hillside is all we can do, the possibilities are endless. All it takes is a “shift” in our imagination! There is a purpose for everything. 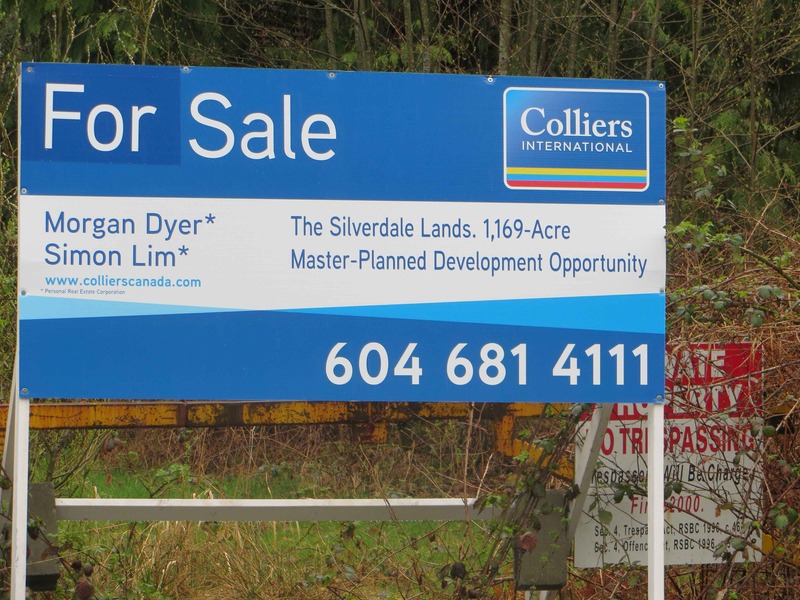 The sale of the Silverdale Lands represents a once in a lifetime opportunity for our community to take a breath, steer our course away from urban sprawl, and listen to the land and all of its inhabitants, past, present, and future. Despite Genstar’s exit from the development scene, CAUSS will continue to monitor and review development activity in the area. This website will be archived while we focus on our Footprint Press publication. The Silverdale public hearings ended at about midnight Dec.10/08 after Mayor Atebe struck several names off the speaker’s list claiming that because these individuals had not used their full 12 minutes on a previous presentation, they were not permitted to make another presentation. He then announced that the hearing would continue until the few remaining names were exhausted. There will be no more opportunity to submit information to council before they make their decision although strangely enough, contacting individual councillors is considered OK.
CAUSS would like to congratulate and thank all those who spoke at and attended the hearings. This was the only opportunity the public had to express and document the public perspective, and it was clear that the issues revealed by these presentations were very serious and important. The public has revealed serious gaps in the plan and in the PDA. Despite extensive marketing of the development as “environmentally responsible”, federal Fisheries and provincial Ministry of Environment scientists do not support the plan or the process. The stream setbacks proposed for this highly sensitive ecosystem are the minimum allowed under current legislation and do little to protect the habitat needs of non-aquatic endangered species. Council admitted the 20 year legally binding Phased Development Agreement was drafted for the benefit of Genstar and the amenities included in the agreement are of little or no benefit to the rest of Mission. Some speakers were clearly harassed and censored by the Mayor and Councillor Stevens, who appeared to be spending much of her time listening to tapes of past presentations, rather than the speakers in front of her, and then interrupted speakers with accusations that they were repeating themselves. Many speakers stated they felt attacked or intimidated. This sad state of affairs does not diminish in any way the importance of what was said and does not negate the need for the public interest to be protected. It is now up to council to at least appear to deliberate, and act on the publics’ concerns. Given Genstar’s recent position that they will not start for at least 2 years due to the economic downturn, there really is no excuse for council to ignore citizen’s concerns. CAUSS recommends that all Silverdale residents arrange to have their wells tested as soon as possible, and keep records of their wells’ water quality and quantity. March 4/08: Over 300 concerned citizens packed the public information meeting in Mission to speak out against the proposed Run of River private power project in the upper Pitt River. The project will divert all 8 tributaries of the Pitt River, devastating the largest remaining wild coho and sockeye salmon runs in the Fraser Valley. The project will build a transmission line through Pinecone Burke Provincial Park, threatening critical grizzly bear and elk habitat, and setting an appalling precedent for industrial intrusions in other provincial parks. “BC Parks has a commitment to protect and manage for all time the natural heritage conserved in the provincial protected area systems” said CAUSS chair, Dr. Tracy Lyster. “This project enables and perpetuates sprawl. By the time the project is complete, the demands for power arising from urban sprawl will exceed what the project contributes. Is the plan to sacrifice every river and stream in BC to feed urban sprawl? What is really needed is better conservation, efficiency and growth containment”. Citizens can voice their concerns at an upcoming public meeting, 6:30 pm, March 25 at the Pitt Meadows Secondary School, 19438- 116B Avenue, Pitt Meadows. If you cannot make the meeting, you have until April 2 to oppose the deletion of land from Pinecone Burke park by emailing: PineconeBurke AT gov.bc.ca. For more information, see www.ourrivers.ca.